I wasn't sure what to expect as I walked into the massive Opus One winery a few weeks ago. The opportunity to survey an estate’s entire production is not something that happens every day. At this level, wines can express so much; the spirit of the people involved, the characteristics of where they are from, and the personality of a vintage. Opus One is among the most famous wines in Napa Valley, but quality has been up and down over the years. How would the wines show? Well, that was answered loud and clear a few hours later. I found the best wines from the early days still in great shape, with a handful that remain truly outstanding. With the last few vintages, Opus One seems to have entered a newfound period of brilliance. There are some disappointments as well, hardly surprising given that production has grown by more than five times since 1979. Along the way there have been changes and bumps in the road, again quite natural, in wine as in life, when enough years are put together. It’s hard to imagine just how revolutionary it must have seemed when Robert Mondavi and Baron Philippe de Rothschild decided to make wine together in Napa Valley. The Mondavis were a hardworking, up and coming family with roots in central Italy, while the Rothschilds were among Europe’s elite. Their partnership would go on to bring an unprecedented amount of visibility and attention to Napa Valley. Opus One was initially conceived as a selection of the best lots at Robert Mondavi Winery. The early vintages were made by Robert Mondavi’s son, Tim, and Mouton Rothschild’s winemaker Lucien Sionneau. Although Tim Mondavi had grown up among the redwood tanks and used brandy barrels at his family’s Charles Krug winery, he was still a young man at the beginning of the joint venture. Sionneau, on the other hand, was a veteran winemaker. The new project had access to all of Robert Mondavi lots in the cellar, capped at 50% of any specific lot in order to ensure the Robert Mondavi wines could maintain their qualitative standard. Tim Mondavi describes his personal style as one geared towards slightly richer, rounder wines, while Sionneau preferred a more structured, austere style. Mondavi also adds that his family was open to risk taking, while Mouton tended to be on the conservative side of things. As a result, Opus One was always filtered, a la Mouton, while the Robert Mondavi wines were not. Sionneau retired in 1984, and was replaced by Patrick Léon, who made Opus One with Tim Mondavi from 1985 to 2000. Genevieve Janssens, Robert Mondavi Winery’s current Director of Winemaking, arrived in 1989. She spent her first two years working the harvest at Mouton before becoming more actively involved at Opus One, where she worked with Tim Mondavi and Patrick Léon from 1991 to 1997. Initially, Opus One was made at Robert Mondavi Winery. In 1991, Opus One moved all winemaking to its present day facility in Oakville. At the same time, a set of historic blocks that had been the backbone of Opus One were formally allocated to the winery to complement the vineyards that surrounded the new building. Opus One continued to have access to other blocks at Robert Mondavi as well. The vintage also signaled the end of a five-year drought period. Stylistically, the wines became richer. Skin contact increased, reaching 33 days in 1991, the longest ever at the time, although subsequent vintages saw even lengthier fermentations. Even today, the Opus One property looks modern, so it is hard to imagine the impression it must have made back then, well before Napa Valley became the super-wealthy region it is today. In 2000 Opus One hired Michael Silacci, formerly of Stag’s Leap Wine Cellars and Beaulieu Vineyard to take over winemaking. Tim Mondavi’s day-to-day involvement gradually receded, while Mouton Rothschild’s new winemaker Philippe Dhalluin joined the team. Silacci is focused on moving the vineyards towards dry farming and increasing clonal diversity. Vineyards are now replanted with as many as four or five different clones that are interspersed within the rows, which Silacci believes increases complexity and nuance in the wines. In 2005, Robert Mondavi Winery was sold to Constellation Brands, along with its 50% interest in Opus One. As part of the transaction, Opus One gained a new parcel known as To-Kalon South, which now augments the existing core holdings in To-Kalon North as well as the sites that surround the winery itself. The most recent releases suggest quality has finally reached a level of consistency that is finally worthy of Opus One’s image and price. The 1979 Opus One emerges from the glass with pine, menthol, sweet red cherries, tobacco, dried flowers and savory herbs. Deceptively medium in body, the 1979 packs a serious punch on the palate, where it still has fabulous depth and remarkable vigor for a wine of its age. Sweet, silky tannins frame the gorgeous finish. What a great start to this tasting. Any remaining bottles need to be enjoyed now, but the 1979 remains superb. Tim Mondavi describes 1979 as a fairly normal year, with a little more rain than normal. The blend is 80% Cabernet Sauvignon, 16% Cabernet Franc and 4% Merlot. Drinking window: 2013-2014. Black cherries, plums, tobacco, incense, new leather, licorice and savory herbs take shape in the 1980 Opus One. A wine of extraordinary richness and pure power, the 1980 impresses for its depth and size. Absolutely nothing is out of place in this impeccably refined, layered wine. Cinnamon, cloves, menthol, hard candy, tar and licorice all flesh out on the rich, resonant finish. Today, the 1980 is firing on all cylinders. It remains a monument to the greatness of California wine. The growing season was long and cool. A late season heat spike pushed the fruit to ripeness, and the winery struggled to pick everything during what turned out to be a fairly narrow window. Tim Mondavi told me that, today, under similar conditions, the fruit would be picked much later. Back then, the custom was to pick only on sugar ripeness. The 1980 is 96% Cabernet Sauvignon and 4% Cabernet Franc. Drinking window: 2013-2020. One of the more compact wines in this tasting, the 1981 Opus One is aromatically high-toned and expressive. The fruit is a bit contained in this vintage, yet the wine remains vibrant and delineated from start to finish. There are barely any signs of oxidation in this pointed, focused Opus One. The To-Kalon richness is a bit in the background, but otherwise, it is hard to fault the 1981 too much, as it has aged impeccably well. The 1981 is 93% Cabernet Sauvignon and 7% Cabernet Franc. Drinking window: 2013-2021. The 1982 Opus One is one of the more direct wines in this complete vertical. There is plenty of fruit in the glass, but at the same time, the tannins aren’t as polished as they are in other vintages of the same era. Today, the 1982 comes across as a bit burly and rough around the edges. The depth of the fruit suggests the 1982 might actually still benefit from further time in bottle! The blend is 82% Cabernet Sauvignon, 16% Cabernet Franc and 2% Merlot. Drinking window: 2015-2022. The 1983 Opus One is absolutely impeccable. Dark red cherries, plums, licorice, tobacco and leather meld together in a wine that is all about balance. Soft and engaging, the 1983 is a great choice for drinking now and over the next decade. The 1983 isn’t as huge or structured as some of the other vintages in this vertical, but it is drop-dead gorgeous. Both 1982 and 1983 show the characteristics of wet vintages with large crops that resulted in somewhat compact wines. In 1983 the Cabernet Sauvignon is a bit low for the era at 80%, while the rest of the blend is composed of 13% Cabernet Franc and 7% Merlot. Drinking window: 2013-2023. The 1984 Opus One is one of the very few disappointing wines in this complete vertical. The bouquet is now fully evolved, although some depth remains in the fruit. At this stage, the 1984 is fully mature. Any remaining bottles should be drunk. At the times it was made, 1984 was the shortest growing season that had been recorded. The blend is 97% Cabernet Sauvignon and 3% Merlot. Drinking window: 2013. A juicy, expressive wine, the 1985 Opus One is showing nicely today. Cinnamon, cloves, leather and dark cherries meld together in an Opus One that is soft, racy and appealing. Hints of brett appear from time to time, but there is almost enough fruit to balance out that imperfection. Overall, the 1985 is a solid but uninspiring Opus One that could have been more than that. The 1985 is 90% Cabernet Sauvignon, 6% Merlot and 4% Cabernet Franc. Drinking window: 2013-2015. The 1986 Opus One surprises for its bright, racy personality. Here the fruit is distinctly high-toned, while the aromatics remain lifted and focused almost to the point of being piercing, which is needless to say unusual for a wine of this age. Then again, 1986 was a year of significant flooding, so it may simply be that the fruit was picked at lower levels of ripeness than the norm. Stylistically, the 1986 belongs alongside leaner vintages such as 1995 and 2011. The blend is 86% Cabernet Sauvignon, 9% Cabernet Franc and 4% Merlot. Drinking window: 2013-2018. One of the highlights in this tasting, the 1987 Opus One is simply gorgeous. Cinnamon, cloves, cigar box, cedar, menthol, licorice and pine all flesh out in a deeply expressive, resonant Opus One of the highest level. I am amazed at how young, vibrant and utterly impeccable the 1987 is. The tannins remain alive, so there is no problem in cellaring bottles for another decade, perhaps longer. At times, the 1987 is a bit rough around the edges, but there is so much exuberance in the fruit that it is easy to overlook some of the wine’s admittedly small imperfections. This compelling Opus One hits all the right notes. The blend is 96% Cabernet Sauvignon, 3% Cabernet Franc and 1% Merlot. Drinking window: 2013-2023. A layered, impeccably graceful wine, the 1988 Opus One is all about textural harmony and balance. Sweet, silky tannins wrap around the expressive fruit in a wine that stands out for its overall harmony. Dark plums, leather, tobacco and spices linger on the polished finish. This is another Opus One that relies more on balance than on pure size. The Cabernet Sauvignon is quite low in this vintage at 85%, while Cabernet Franc, at 13%, is much more pronounced. A dollop of Merlot rounds out the blend. Drinking window: 2013-2023. One of the powerhouses in this vertical, the 1989 Opus One explodes from the glass with layers of resonant fruit. Over time, the intensity of the fruit fades a little as some slightly more rustic elements – including a suggestion of brett – emerge. A spell of rain brought some relief to the drought-striking plants. 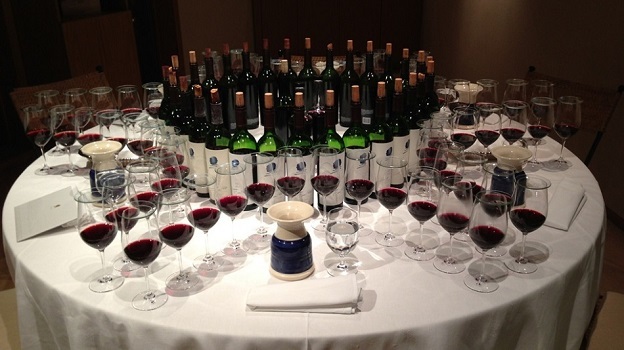 The 1989 is 97 Cabernet Sauvignon, 2% Cabernet Sauvignon and 1% Merlot. Drinking window: 2013-2019. The 1990 Opus One is another powerful wine built on a serious core of tannin and structure. There is plenty of richness in the glass, but a little less intensity and complexity than the best wines of this era. I imagine the 1990 will still be a delicious wine in another decade. The 1990 is 87% Cabernet Sauvignon, 10% Cabernet Franc and 3% Merlot. Drinking window: 2013-2025. The 1991 Opus One is completely different from its predecessors. The style is decidedly rich, voluptuous and opulent for the era. Sweet silky tannins support a creamy, expressive finish in a wine that is very much built on texture. Today the 1991 is showing beautifully. The slightly advancing aromatics suggest it is best enjoyed over the next decade. The 1991 is a racy Opus One long on personality. The blend is 93% Cabernet Sauvignon, 6% Cabernet Franc and 1% Merlot. Drinking window: 2013-2021. A mélange of dark raspberries, menthol, savory herbs and anise jump from the glass in the 1992 Opus One. The aromas are a little more advanced than the fruit, but the 1992 still has plenty of depth, richness and pure sensuality. Readers may want to give the 1992 a year or two to see if the tannins have a little more sweetness to give. In 1992 the blend is 89% Cabernet Sauvignon, 8% Cabernet Franc and 3% Merlot. Drinking window: 2015-2022. The 1993 Opus One is a wine of pure impact. The fruit is front and center in this bold, juicy Cabernet Sauvignon. Slight elements of brett detract from the wine’s balance, but the 1993 has enough depth to drink well for at least another decade, if not considerably longer. The blend is 89% Cabernet Sauvignon, 7% Cabernet Franc and 4% Merlot. Drinking window: 2013-2023. The 1994 Opus One is a beautiful, symmetrical wine endowed with stunning balance and pure class. Silky, nuanced and delineated, the 1994 takes shape nicely in the glass. Unfortunately, this is another vintage affected by brett, but at the same time, there are plenty of positive attributes that compensate to some degree. Still, it is quite obvious the 1994 could have – and should have – been a more important wine, perhaps even more than that. The blend is 93% Cabernet Sauvignon, 4% Cabernet Franc, 2% Merlot and 1% Malbec. Drinking window: 2013-2019. Freshly cut flowers, raspberries, anise and savory herbs jump from the glass in the 1995 Opus One. A beautifully bright, focused wine, the 1995 stands out for its high-toned aromatics and fabulous balance. All the elements are in the right place. This is a distinctly pretty, feminine Opus One that is all about grace. An attractive aromatic lift rounds things out nicely. Stylistically, the 1995 belongs to the wines of similarly high rainfall vintages such as 1986 and 2011. The 1995 is 86% Cabernet Sauvignon, 7% Cabernet Franc, 5% Merlot and 2% Malbec. Drinking window: 2013-2023. A total opposite of the 1995, the 1996 Opus One blasts from the glass with massive dark fruit, iron, scorched earth, graphite and new leather. The 1996 is one of the more virile, bombastic wines in this vertical. Plums, cloves, leather and tar all flesh out on the huge, imposing finish. Although a bit rustic and brooding, the 1996 is an outstanding wine if taken on its own terms. The finish is framed by substantial tannins and an element of burliness that is likely the result of a succession of heat spikes. In 1986 Opus One is 86% Cabernet Sauvignon, 8% Cabernet Franc, 3% Merlot and 3% Malbec. Drinking window: 2013-2023. The 1997 Opus One tastes like it was made yesterday, not 16 years ago. One of the most opulent, racy wines in this vertical, the 1997 literally explodes from the glass. Juicy dark red cherries, menthol, tobacco and licorice all make an appearance as the 1997 opens up over time. Readers holding the 1997 are in for a thrill. Even though the growing season was defined by hot weather, a short maturation cycle and a large crop, the wine turned out beautifully. In 1997 the blend is 82% Cabernet Sauvignon, 8% Cabernet Franc, 5% Merlot, 4% Malbec and 1% Petit Verdot, a first for Opus One. Drinking window: 2013-2032. Next to the 1997, the 1998 Opus One is naturally a bit slender, but it, too, boasts striking balance. Savory herbs, mint, licorice and plums are woven together in a fabric of notable class. Still young and vibrant, the 1998 is an excellent choice for drinking now and over the next decade. The focus, length and persistence are all super-impressive, especially within the context of a challenging vintage. The 1998 is 91% Cabernet Sauvignon, 7% Cabernet Franc, 5% Merlot, 1% Malbec and 1% Petit Verdot. Drinking window: 2013-2023. Crushed flowers, sweet tobacco, dried cherries and incense are some of the notes that take shape as the 1999 Opus One emerges from the glass. This is a decidedly mid-weight Opus One that should be enjoyed over the next few years. The 1999 doesn’t have the opulence of the 1997 nor the energy of the 1998, rather it is a wine built on texture and balance, two highly admirable qualities, to say the least. In 1999 Opus One is 84% Cabernet Sauvignon, 7% Merlot, 5% Cabernet Franc, 3% Malbec and 1% Petit Verdot. Drinking window: 2013-2020. The 2000 Opus One comes across as a smaller-scaled version of 1997. It shares much of the exuberance and raciness of that year, but with less structure. Readers who enjoy the riper Opus Ones and are looking for a vintage to drink today should consider the 2000. Today the 2000 is peaking. It is hard to see much upside from further cellaring. Hints of truffle, black pepper and orange peel linger on the exotic, beguiling finish. The blend is 84% Cabernet Sauvignon, 6% Merlot, 5% Cabernet Franc, 3% Malbec and 2% Petit Verdot. Drinking window: 2013-2023. The 2001 Opus One bursts from the glass with layers of opulent fruit. Still quite youthful, the 2011 impresses for its elegant, mid-weight personality. Compared to the best wines of this era the 2001 comes across as a bit forward. I imagine the 2001 will drink well for another decade or so, but it won’t be super long-lived next to its peers. Still, there is plenty to like here. The 2001 is 87% Cabernet Sauvignon, 6% Merlot, 3% Malbec, 2% Cabernet Franc and 2% Petit Verdot. Drinking window: 2013-2023. The 2002 Opus One is a big step up from the 2001. Freshly cut flowers, juicy raspberries, anise and sweet spices literally jump from the glass in an Opus One that is all about opulence and huge, voluptuous fruit. Juicy, vibrant and impeccably balanced, the 2002 is firing on all cylinders today. The creamy, layered finish is simply impeccable. This is a fabulous showing. In 2002 Opus One is 86% Cabernet Sauvignon, 6% Merlot, 3% Cabernet Franc, 3% Malbec and 2% Petit Verdot. Drinking window: 2013-2023. The 2003 Opus One comes across as a bit of a brute. Stylistically, the 2003 is rich, dark and quite powerful. The early signs of aromatic development suggest the 2003 won’t be especially long-lived. As the huge, super-ripe fruit fades the tannins are likely to become even more prominent, exposing the challenging nature of a year in which phenolic ripeness was hard to achieve. The 2003 harvest stretched a full six weeks, from mid-September to early November, quite unusual by Napa Valley standards. In 2003 Opus One is 91% Cabernet Sauvignon, 3% Cabernet Franc, 3% Petit Verdot, 2% Merlot and 1% Malbec. Drinking window: 2013-2023. The 2004 Opus One is the first wine in this vertical that is still completely primary. Juicy, layered and expressive, the 2004 needs at least five more years in the cellar to shed some of its youthful exuberance, but frankly that may not be enough. There is a lot of promise here. The blend is 86% Cabernet Sauvignon, 7% Merlot, 4% Petit Verdot, 2% Cabernet Franc and 1% Malbec. Drinking window: 2019-2034. A dark, implosive wine, the 2005 Opus One comes across as brooding and very much closed in on itself. Tar, graphite, menthol, licorice and plums inform the powerful, structured finish. This is the most massive, tannic Opus One in recent memory. The blend is 88% Cabernet Sauvignon, 5% Merlot, 3% Petit Verdot, 3% Cabernet Franc and 1% Malbec. Drinking window: 2015-2035. I expected the 2006 Opus One to be more reticent than it actually is. Dark plums, black cherries, licorice, tar and smoke all take shape as the 2006 opens up in the glass. Overall, this is a supple Opus One with good complexity but less of the personality of the best wines of the year. In 2006 the blend is 77% Cabernet Sauvignon, 12% Merlot, 5% Cabernet Franc, 3% Petit Verdot and 3% Malbec. The style is relatively juicy, partly owing to the highest presence of Merlot ever. Drinking window: 2014-2026. There is so much to like about the 2007 Opus One. A wine that captures the essence of the year, the 2007 is exotic, flashy and striking. Kirsch, rose petals, pomegranates and spices form a fabric of compelling beauty. The 2007 is rich, sumptuous and generous, just as it should be. Threads of striking perfume are woven throughout, adding aromatic lift and pure sensuality. Readers who like more structured wines are likely to gravitate towards vintages such as 2010, but years like 2007 offer immense pleasure and an immediacy I find impossible to resist. A sumptuous, layered finish rounds things out in stunning style. The blend is 79% Cabernet Sauvignon, 8% Merlot, 6% Cabernet Franc, 6% Petit Verdot and 1% Malbec. Drinking window: 2013-2022. Next to the 2007, the 2008 Opus One comes across as dark, powerful and brooding. Tar, savory herbs, licorice, blackberry jam and grilled herbs are some of the many notes that explode from the glass in a masculine, virile Opus One that stands out for its sheer personality. The 2008 reminds me a little of the 2005, but it has even more polish and sweetness, especially in the tannin. The Opus One is 86% Cabernet Sauvignon, 8% Petit Verdot, 4% Merlot, 1% Cabernet Franc and 1% Merlot. Drinking window: 2016-2038. The 2009 Opus One is impeccable. It brings together the silkiness of the 2007 with the power and darkness of the 2008, a combination that is hugely appealing, to say the least. With a little air, the 2009 can be enjoyed young, but it is best cellared for at least a few years, which will allow some of the baby fat to drop off. The blend is 81% Cabernet Sauvignon, 9% Cabernet Franc, 6% Petit Verdot, 3% Merlot and 1% Malbec. Drinking window: 2019-2039. One of the highlights among the more recent releases, the 2010 Opus One is flat-out gorgeous. Dark cherries, plums, graphite, cassis and pencil shavings are all woven together in a fabric of notable class and elegance. The 2010 stands out for its exceptional minerality, tension and pure power. Readers will have to be patient. This is a picture perfect rendering of this great Napa Valley Cabernet Sauvignon vintage. Drinking window: 2020-2035. The 2011 Opus One naturally comes across as a bit slender next to its contemporaries. Still, there is quite a bit to admire. A distinctly floral-infused bouquet melds into sweet red fruit. The finish is graced with considerable aromatic intensity and lift. Overall, the 2011 shows quite a bit of potential, especially within the context of a year that was extremely challenging. Drinking window: 2021-2031. It’s obviously very early, but the 2012 Opus One is one of the bigger, darker wines of the vintage at this stage. Tar, smoke, licorice and black fruit are some of the many notes than inform this muscular, deeply pitched Opus One. It will be interesting to see if time attenuates some of the wine’s pure unbridled power. Drinking window: 2022-2032.